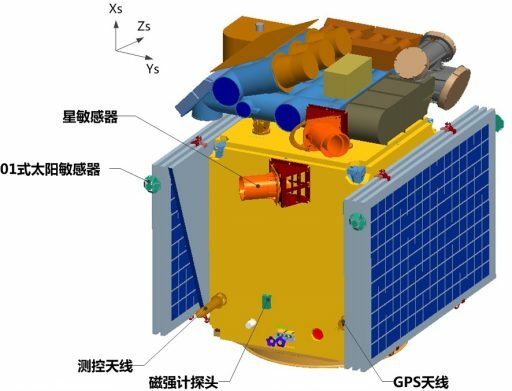 TanSat, Tan being the Chinese word for Carbon, is China’s first mission dedicated to Carbon Dioxide detection and monitoring using a payload of two instruments to track the atmospheric CO2 concentration and variability. Funded by the Ministry of Science and Technology, the TanSat project was initiated in January 2011 to develop a small satellite mission for the detection of CO2 using a high-resolution spectrometer for the measurement of Carbon Dioxide via its near-infrared absorption bands, and a Cloud and Aerosol Polarimetry Imager to correct errors in the spectroscopic data caused by suspended aerosols and clouds. 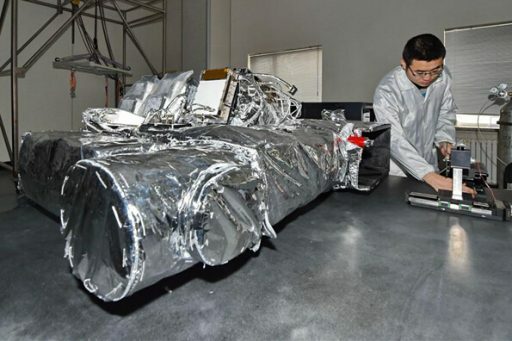 The 500-Kilogram TanSat spacecraft has the main objective of measuring the atmospheric column-averaged CO2 dry air mole fraction with a precision better than four parts per million over the Chinese and international territory. Scientific goals of the mission include understanding the global CO2 distribution, variations over time and its role in climate change phenomena. Responsible for the overall management of the project is the Chinese Academy of Sciences, the satellite platform is developed by the Shanghai Institute of Microsystems and Information Technology, and the payloads are manufactured at the Changchun Institute of Optics, Fine Mechanics and Physics. 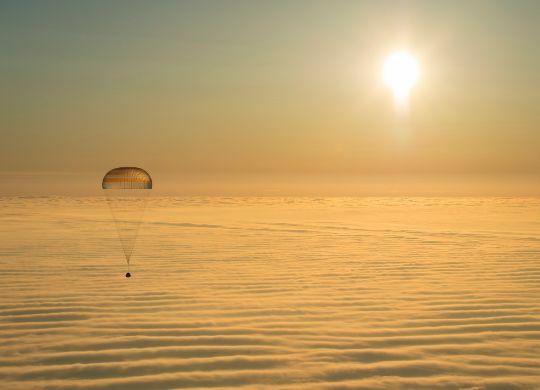 The ground segment for the mission is managed by the National Satellite Meteorological Center. The University of Leicester and the University of Edinburgh, UK participate in the mission as an international partners. TanSat is tasked with a mission of at least three years, operating from a Sun Synchronous Orbit with an equator crossing at 13:30 local time and a revisit cycle of under 16 days. Measurements can be made as nadir, sun-glint and target observations with in-orbit calibration features to guarantee the accuracy of CO2 retrievals. As a large developing country, China has the world’s highest levels of Greenhouse Gas emissions and the Chinese government identified the need for reducing GHG emissions, requiring access to spaceborne data on CO2 sources and sinks. As a primary driver in climate change, Greenhouse Gases have been an important aspect of scientific study and a number of spacecraft to measure their distribution and temporal variation have flown in recent years including hosted instruments on weather satellites and dedicated missions such as ESA’s Greenhouse Gases Observing Satellite and NASA’s Orbiting Carbon Observatory. To contribute to the study of CO2 in Earth’s atmosphere, the China Academy of Science initiated in 2011 a five-year program to study the Carbon Budget and Relevant Issues and provide the information needed by policy-makers for informed decisions furthering a sustainable development plan to reduce GHG emissions. The TanSat spacecraft utilizes a box-shaped satellite platform supporting the payload deck on the +X panel of the vehicle with a common instrument boresight to +Z which will constantly be facing the Earth. A pair of solar arrays are installed on the Y-panels of the satellite and constantly point to the -X direction when the satellite is in its duty attitude. The overall dimensions of TanSat are 150 by 180 by 200 centimeters in its stowed configuration with a launch mass of approximately 500 Kilograms including a 10-Kilogram propellant supply to support orbit maintenance over a three-year primary mission. With its solar arrays deployed in orbit, TanSat measures 7.4 meters from tip to tip. The Electrical Power System of the spacecraft hosts two three-panel solar arrays with a total surface area of 10 square meters to ensure an end-of-life power generation of 1790 Watts. Power is fed to a central Power Control Unit that distributes a regulated 28-Volt power bus to the various satellite subsystems and manages the state of charge of a Li-Ion battery unit with a total capacity of 80 Amp-hours. TanSat uses a three-axis stabilization system with a variety of attitude sensors and actuators. Attitude Determination is provided by a pair of star trackers in use as the primary attitude sensors, collecting imagery of the star-filled sky that are then compared with an onboard catalog to deliver accurate attitude data to the onboard computers. Data on body rates is captured by two gyros in use during de-tumbling and slew maneuvers while a pair of three-axis magnetometers delivers data on the magnetic field vector for the actuation of magnetic torque rods. Three sun sensors are available for attitude determination in a satellite safe mode to ensure proper sun-pointing of the solar arrays for power generation. Attitude actuation is provided by four reaction wheels to deliver a stable pointing capability for measurements in an Earth-pointed attitude. Momentum is unloaded from the reaction wheels by four magnetic torque rods and four hydrazine monopropellant thrusters can assist in attitude control during de-tumble after launch and in safe mode. The thrusters are also in use for orbit adjustments and regular maintenance maneuvers to maintain the 13:30 equator crossing time to within 15 minutes over the course of the three-year mission. The four 1N thrusters reside on the -X panel of the satellite and are fed from a 20-liter hydrazine tank filled with 10kg of propellant at the start of the mission. TanSat’s attitude determination system delivers attitude solutions with an accuracy better than 0.03 degrees while the attitude actuators point the spacecraft to within 0.1 degree of the commanded orientation. TanSat makes use of a centralized data handling system featuring an onboard computer that is in charge of all satellite functions from commanding of all subsystem activities, flight dynamics control, attitude data processing, payload data management and storage, telemetry control to thermal and power control. A CAN bus provides connectivity between the main computer and the payload controller as well as all other subsystems. Command uplink and health data downlink is accomplished with an S-Band terminal supporting full-duplex communications at a 2kbps uplink and 8.192kbps downlink data rate. A high-speed X-Band system is employed for the downlink of payload data at a rate of 64Mbps. Two antennas support the X-Band system, one pointed directly nadir (+Z) and one canted by 25 degrees to maximize downlink time when the satellite is in sun-glint observation mode, avoiding an attitude change for communications sessions. A 128 GBit onboard storage device holds collected payload data for downlink – typically within eight hours of acquisition. 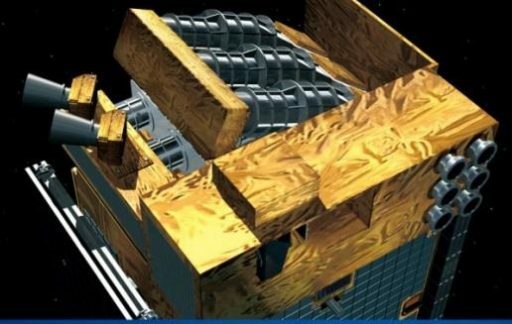 The TanSat spacecraft will operate from a Sun Synchronous Orbit near 700 Kilometers in altitude, inclined 98.2 degrees. 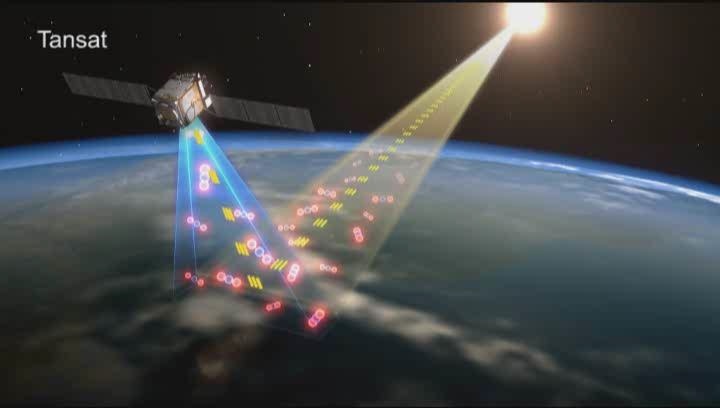 There was discussion of TanSat joining the international A-Train of satellites managed by NASA – a chain of Earth observation satellites carrying different instruments and flying in close succession of one another to collect complementing data sets to maximize the science return of each mission. However, requirements for joining the A-Train were too complex for the TanSat mission and it was decided to have the satellite operate in an independent orbit. 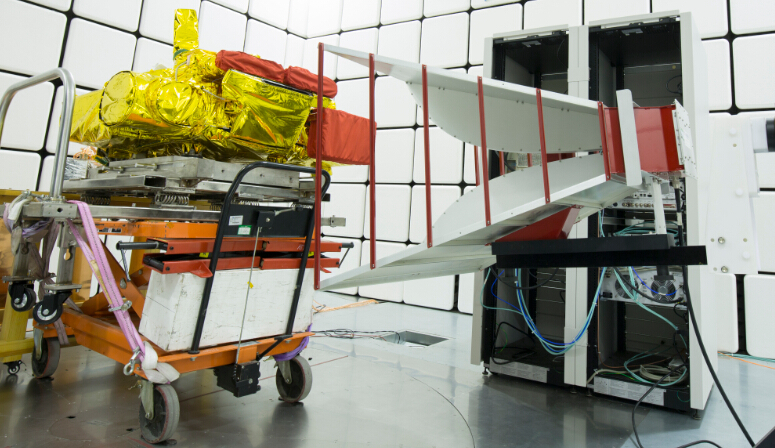 TanSat is outfitted with a pair of instruments – the Carbon Dioxide Spectrometer CarbonSpec and CAPI, the Cloud and Aerosol Polarimetry Imager which delivers data for the correction of CarbonSpec measurements which are influenced by clouds and suspended aerosols. Both instruments are integrated in a common structure and share an electronics box. The instruments point to the same geographic location with precise alignment being maintained by the structural system of the payload. The Carbon Dioxide Spectrometer, CDS in short, is a high-resolution grating spectrometer taking advantage of the near-infrared absorption bands of Carbon Dioxide at 1.61 and 2.06 micrometers as well as the molecular oxygen A-Band at 760 nanometers. The instrument is comprised of a pointing subsystem, a telescope, beam splitters, diffraction grating spectrometer and focal plane unit. 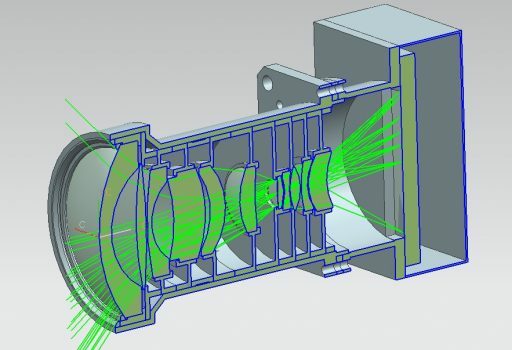 The Pointing Subsystem hosts a mirror that can be rotated 360 degrees to a) select the target location from -30° to +10° in cross track, and b) place a diffuse reflector into the optical path to direct diffuse sunlight into the instrument for in-flight calibration. 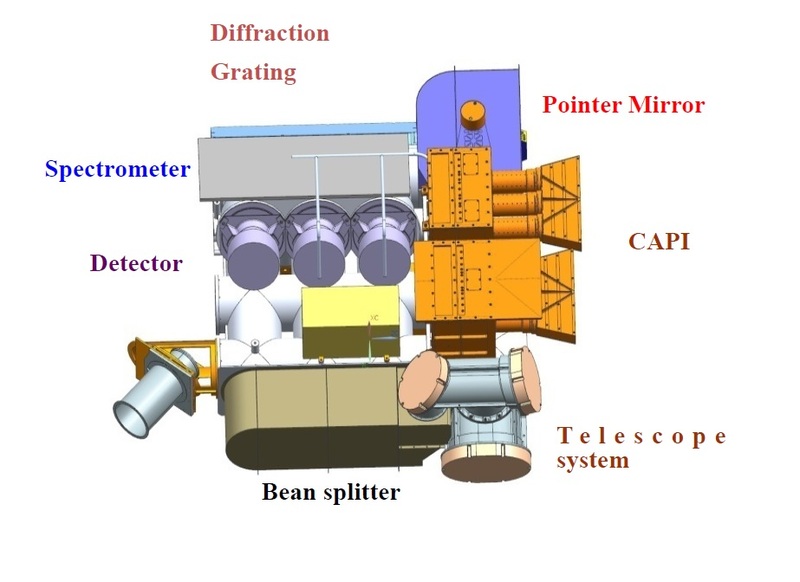 The telescope assembly focuses the incoming radiation onto the grating that acts as dispersive element of the spectrometer before the dispersed radiation is directed to the respective detector elements via three beam splitters. The Oxygen A-Band channel covers a spectral range of 758 to 778 nanometers, delivering data at a spectral resolution of 0.044 nanometers. For the weak CO2-Band, the instrument covers a spectral range of 1594 to 1624 nm with an 0.12nm spectral resolution while the strong CO2 absorption band falls within the 2042 to 2082nm range of the 2.06µm detector element, delivering spectral data at a 0.16nm resolution. The CDS instrument achieves a spatial resolution of 1 by 2 Kilometers and covers a 20-Kilometer wide ground swath. CAPI – the Cloud and Aerosol Polarimetry Imager – is a wide field of view moderate resolution imaging spectrometer with polarization-sensitive channels. The purpose of the instrument is to collect data concurrently with CDS to compensate for errors in spectral data caused by clouds and aerosols. This is accomplished by making observations across five wavelength channels. 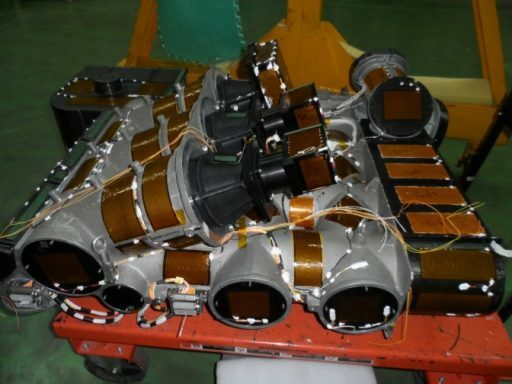 CAPI uses six separate telescope assemblies and detectors covering nine channels in five spectral bands – an ultraviolet band at 365-408 nanometers, a visible band at 660-685 nm and three infrared bands at 862-877, 1360-1390 and 1628-1654nm. The visible and last infrared band are polarization sensitive for angles of 0/60/120 degrees. Each of the five bands hosts its own detector comprised of 1600 pixels for the UV, VIS and 0.87µm channels and 800 pixels for the remaining infrared channels. The CAPI instrument covers a 400-Kilometer ground swath and reaches a ground resolution of 0.5 Kilometers. 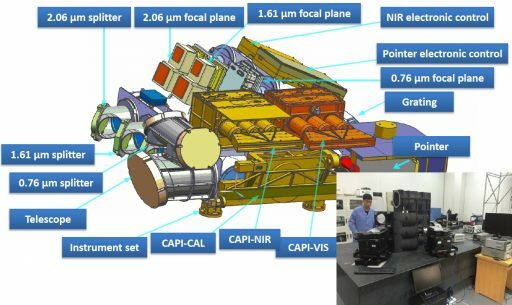 The localization accuracy of each instrument is better than one pixel, allowing CAPI data to be used to correct readings from the spectrometer. The polarization-sensitive channels enhance the retrieval accuracy of clouds and aerosols to give the dual-instrument an accuracy between 1 and 4 parts per million for the measurement of XCO2 (CO2 dry air mole fraction). Instrument accuracy will be verified through a multi-site ground based measurement network in China with a 0.2ppm accuracy. The CDS/CAPI instruments will operate in different modes depending on the terrain being overflown by TanSat. Measurements over land will be primarily made in nadir mode while sun-glint observations are conducted over the Ocean. Target mode is available to examine targets of interest from multiple angles using the satellite’s slew capability. Calibration of CDS is accomplished through diffuse solar calibration and an onboard LED light source while CAPI also uses an onboard calibration source as well as lunar and solar calibration readings completed at regular intervals during the mission. 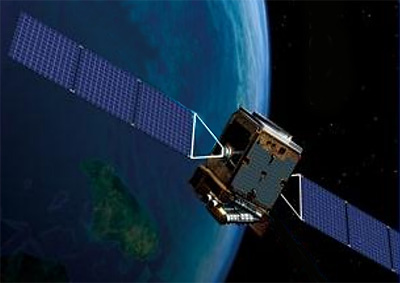 TanSat uses the ground segment established for the operation of the Fengyun weather satellites including the Mission Control tools, science data reception and distribution functions and archiving protocols in an overall effort to reduce cost by implementing a high degree of commonality between different missions.